Strategy and vision can come to nought unless we get our people at all levels to take the right actions. This is a concern that many of my clients in leadership roles face. What can we do to make it more likely that the vision and strategy in our heads turn into the actions and results that we want and need? I believe we need to create our strategy and detailed plans around common purpose. This common purpose is the “big why” that people at all levels, in all roles, can buy in to. Part of leading our teams is to curate and communicate the vision for where we are going. We also need to explain where we’re going, and why, and what actions we all need to take to contribute to making the vision a reality. One of the hardest parts of doing this is to work out how a single “why” can resonate with so many different roles. After that, we need to then work out how that “why” drives the “what and how” for each role in our team. Purpose-driven planning is one of the approaches I use to pull together a single overall purpose and the specific drivers and actions for each team or area. This is a technique that visually shows the support each area gives to the overall purpose, whilst drilling down into the root causes and actions needed to make the changes real. The purpose-driven plan explicitly links day-to-day actions with delivering the overall strategy. Making this link obvious to all is vital, in my experience, to getting people pulling together in making change happen, even through difficult or complex changes. However you choose to create and communicate your strategy, your message is undoubtedly stronger if people feel that their purpose is part of the overall reason for delivering change. Please contact us to find out how we can help you create and implement your own purpose-driven plan. This entry was posted in Blog on June 26, 2017 by Keith. This entry was posted in Blog, Taking Action and tagged Action, GoalStormer, MyDiagnostic.Online, People, Strategy on June 16, 2017 by Keith. Total Clothing wanted to involve people from right across the team to streamline their processes, to prepare in advance for another year of major growth. They asked Critical Action to help with building vision, identifying changes and putting a plan into action. “We worked with many of our team, led by Keith, to identify bottlenecks in our processes and by voting on the most urgent issues, gave everyone a sense of inclusion and buy-in. It has brought the team so much closer in terms of working towards common goals and also in the way they communicate with each other on an ongoing basis. We are really thinking differently as a team about the way we operate and this is translating into actions and profitability. This entry was posted in Analysis, Blog, Case Studies, Communication, People, Planning, Priority, Strategy, Taking Action and tagged Action, Analysis, Objectives, People, Planning, Prioritisation, Teamwork on April 20, 2017 by Keith. 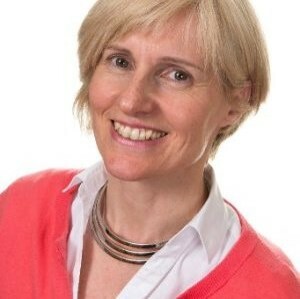 I’ve been asked recently to present on my experiences in business analysis, and how they might help businesses and IT teams work together as they prepare for GDPR. The talk, with its examples and stories from the trenches, has gone down well with the audience, so I decided to record it as an on-demand webinar. You can find the webinar at https://youtu.be/eJBXUajwK_U or watch it here. This entry was posted in Analysis, Blog, Taking Action and tagged Action, Analysis, Planning, Prioritisation, Strategy on April 3, 2017 by Keith. I’m a fan of the Pomodoro Technique when it comes to quick blasts of productivity. Here’s a quick tip for how to use it on your PC. 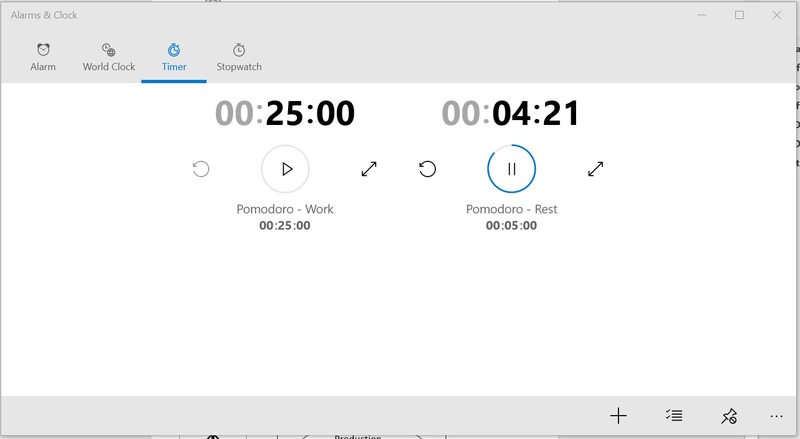 As well as the natty tomato-shaped physical timer I have, I also use Windows 10’s Alarms & Clock app to make a virtual pomodoro… Search for “Alarms and Clock” in the search bar, then click “Timer” in the app. Simply set up and save two timers, one for 25 minutes and one for 5 minutes. Then just alternate between the two when you want to Pomodoro-ify your time! This entry was posted in Blog, Taking Action and tagged Action, Streamlining on November 23, 2016 by Keith. 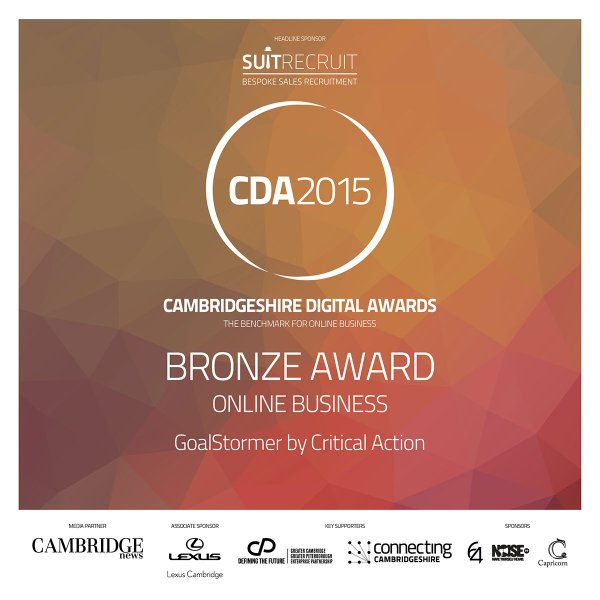 We’re absolutely delighted to come away from last night’s Cambridgeshire Digital Awards as winners of the Bronze Award for Online Business! GoalStormer.com is our online platform that helps managers and mentors achieve more with their teams and clients through time-saving, flexible goal setting & tracking on the web & via email. Up against some big competition in this most innovative of regions, we were proud to be one of seven finalists from the many, many entrants, and then to take third place overall for Online Business is great recognition of what we are doing on our mission to “unleash awesome” with GoalStormer. Find out more at http://web.goalstormer.com! This entry was posted in Blog and tagged GoalStormer on November 20, 2015 by Keith. We’ve been doing a fair bit of work recently around roles and role-based access. These projects have been around things like Active Directory, new ERP/CRM systems implementations, changes to responsibilities and working processes, and data migrations. If this sounds like something you’re about to embark upon, and you’d like some assistance with the analysis and logical design, to feed into your technical design, you might find our short role-based permission white-paper gives you some food for thought. Over a few pages, we share a summary of our thinking, observations and ideas for why role-based access is good, what sort of questions to ask, and how to map roles to groups to permissions. We’d be delighted to talk you through our approach in more detail if you’d like to contact us. This entry was posted in Analysis, Blog, People, Planning, Strategy, Understanding and tagged Action, Analysis, Planning, Strategy, Streamlining on October 12, 2015 by Keith. 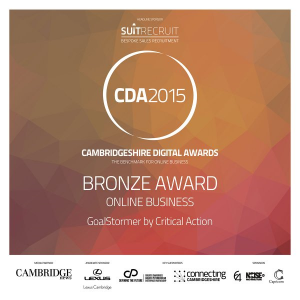 If you track our GoalStormer blog, you’ll have spotted that GoalStormer is up for another award (yay!). This entry was posted in Taking Action and tagged GoalStormer on October 2, 2015 by Keith. Critical Action created GoalStormer.com as a platform for coaches, mentors and managers to help others achieve great things. We’re encouraging all of our coach, mentor and manager users and friends – whether you use GoalStormer as your platform or not – to regularly take our 10-question survey “Effective Goals, Brilliant People”. We want to work with our community to pool our insight into what helps and what hinders people achieve what matters to them. Together with stats from GoalStormer itself, we are building a rich view of what makes a difference to rates of achievement, and what works with busy people in the modern world. It take just a few minutes to answer the ten simple questions, and if you enter your email address, we’ll email you out the survey findings every now and then. This entry was posted in Blog on August 21, 2015 by Keith. We wanted to mention a new feature of our GoalStormer platform, for those of you who manage staff performance. It’s important to discuss, agree, set and track goals with your people; but it can be time consuming to keep on top of, and often suffers at the hands of other day-to-day priorities. That’s why we’ve introduced automatic scheduled reports into the GoalStormer ProHub (for Pro account users). For users in your groups, or who have set you as a coach, you can already generate progress summary reports on demand. We’ve added a new “Schedule” button. This lets you pick a day of the month and a “how many months” frequency for reports to be generated and emailed to you as a PDF. You can do this per user, and you can switch the schedules on and off individually. This means once you’ve agreed initial goals with users, you can sit back and let GoalStormer remind and inform you when it’s time to review progress with individuals. Simple, but effective. Just how we like it! This entry was posted in Blog, People, Taking Action and tagged Action, Streamlining, Teamwork on April 14, 2015 by Keith.